Choose comfort, quality and sharp looks with men's sweater style jackets from Banana Republic Factory. Enjoy the convenience and comfort of a jacket with the tailored look and sleek appeal of a sweater with men's sweater jackets from Banana Republic Factory. This collection features unique jackets that are made from soft sweater material so you can stay warm and in-style no matter what your day holds. Browse sweater style jackets in various styles from hoodie to pullover, and in chic colors and patterns from neutrals to stripes. Whether you're looking for a comfortable piece you can layer at the office, rock out on the town, or snuggle in on the weekend, these versatile jackets are sure to please. 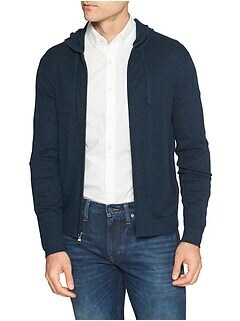 Shop sweater style jackets for men from Banana Republic Factory today. What do you get when you combine premium fabrics and sleek design? 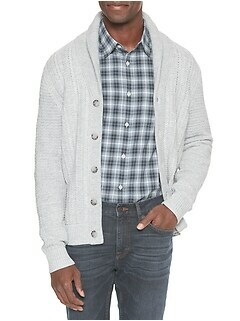 Sweater jackets for men from Banana Republic Factory. Crafted from luxurious materials like cashmere, cotton, nylon and other premium fabrics, these pieces are always soft and comfortable. Flattering cuts like relaxed, slim, hip length, fitted and more allow you to show off your shape to its best advantage, while easy sizes from XS through XXL make it simple to choose what's best for your frame. Choose a jacket with full or quarter zip, buttons, or pull-over style. Details like welt pockets, ribbing, cowl necks and more add both interest and function. Craft approachable yet put-together looks with sweater style jackets from Banana Republic Factory. With stylish details and effortless appeal, these versatile pieces are easy to dress up or down depending on your day or the occasion. They look great with casual jeans and formal trousers alike. These pieces are simple to layer as they conveniently mix and match with button downs, polos and t shirts. The options are endless with these easygoing garments. 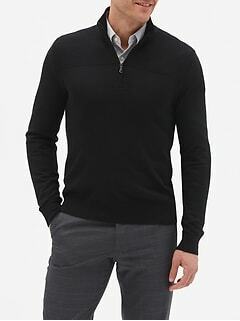 If you're looking for a relaxed yet polished look, you can't go wrong with sweater style jackets for men from Banana Republic Factory.